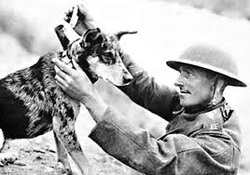 Dogs have lived and worked with humans in so many roles that they have earned the unique nickname, "man's best friend", a phrase used in other languages as well. They have been bred for herding livestock, hunting (e.g. pointers and hounds), rodent control, guarding, helping fishermen with nets, detection dogs, and pulling loads, in addition to their roles as companions. Service dogs such as guide dogs, utility dogs, assistance dogs, hearing dogs, and psychological therapy dogs provide assistance to individuals with physical or mental disabilities. Some dogs owned by epileptics have been shown to alert their handler when the handler shows signs of an impending seizure, sometimes well in advance of onset, allowing the owner to seek safety, medication, or medical care. A hunting dog - refers to any dog who assists humans in hunting. There are several types of hunting dogs developed for various tasks. The major categories of hunting dogs include hounds, terriers, dachshunds, cur type dogs, and gun dogs. 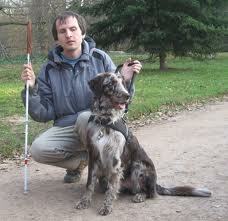 Among these categories further divisions can be made based upon the dogs' skill sets. Although various animals have been used to aid the hunter, none has been as important as the dog. The domestication of the dog has led to a symbiotic relationship in which the dog has lost its evolutionary independence from humans in exchange for support. Dogs today are used to find, chase, and retrieve game, and sometimes to kill it. Hunting dogs allow humans to pursue and kill prey that would otherwise be very difficult or dangerous to hunt. Different breeds of dogs are used for different types of hunting. Waterfowl are commonly hunted using retrieving dogs such as the Labrador Retriever, the Golden Retrievers, the Chesapeake Bay Retriever, and others breeds similar. A herding dog - also known as a stock dog or working dog, is a type of pastoral dog that either has been trained in herding or belongs to breeds developed for herding. Their ability to be trained to act on the sound of a whistle or word of command is renowned throughout the world. In Australia, New Zealand and the United States herding dogs are known as working dogs irrespective of their breeding. Some herding breeds work well with any kind of animals; others have been bred for generations to work with specific kinds of animals and have developed physical characteristics or styles of working that enhance their ability to handle these animals. Commonly mustered animals include cattle, sheep, goats and reindeer, although it is not unusual for poultry to be handled by dogs. Australia has the world's largest cattle stations and sheep stations and some of best-known herding dogs, such as the Koolie, Kelpie, Red and Blue Heelers are bred and found there. Dogs in warfare - have a long history starting in ancient times. From 'war dogs' trained in combat to their use as scouts, sentries and trackers, their uses have been varied and some continue to exist in modern military usage. War dogs were used by the Egyptians, Greeks, Persians, Sarmatians, Alans, Slavs, Britons, and the Romans. The Molossian 'Canis Molossus' dog of Epirus was the strongest known to the Romans, and was specifically trained for battle. However, when fought against the broad-mouthed, powerful mastiff of Britannia, they were outmatched. The Romans imported many of this breed of mastiff to Rome and then disseminated them over the known world. Often war dogs would be sent into battle with large protective spiked metal collars and coats of mail armor. The Romans had attack formations made entirely of dogs. Native Americans also used dogs, though not on this scale. 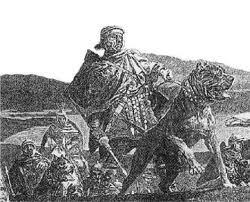 During the Late Antiquity, Attila the Hun used giant Molosser dogs in his campaigns. Gifts of war dog breeding stock between European royalty were seen as suitable tokens for exchange throughout the Middle Ages. Other civilizations used armored dogs to defend caravans or attack enemies. The Spanish conquistadors used armoured dogs that had been trained to kill and disembowel when they invaded the land controlled by South American natives.The British used dogs when they attacked the Irish and the Irish in turn used Irish Wolfhounds to attack invading Norman knights on horseback. Two wolfhounds, or even a single one were often capable of taking a mounted man in armour off his horse, where the lightly armed handler would finish him off if necessary. Later on, Frederick the Great used dogs as messengers during the Seven Years' War with Russia. Napoleon would also use dogs during his campaigns. Dogs were used up until 1770 to guard naval installations in France. The first official use of dogs for military purposes in the United States was during the Seminole Wars. The American Pit Bull Terrier was used in the American Civil War to protect, send messages, and as mascots in American World War I propaganda and recruiting posters. A police dog - often referred to as a "K-9 dog" in some areas (which is a homophone of canine), is a dog that is trained specifically to assist police and other law-enforcement personnel in their work. One commonly used breed is the German Shepherd, although now Belgian Malinois are popular dogs to use. In many jurisdictions the intentional injuring or killing of a police dog is a felony, subjecting the perpetrator to harsher penalties than those in the statutes embodied in local animal cruelty laws, just as an assault on a human police officer is often a more serious offense than the same assault on a non-officer. A growing number of law-enforcement organizations outfit dogs with ballistic vests, and some make the dogs sworn officers, with their own police badges and IDs. Furthermore, a police dog killed in the line of duty is often given a full police funeral. Some breeds are used to enforce public order by chasing and holding suspects, or detaining suspects by the threat of being released, either by direct apprehension or a method known as Bark and Hold. German Shepherd Dogs and Belgian Malinois are most commonly used because of their availability (see List of police dog breeds); however other dog breeds have also contributed, such as Dutch Shepherds, Rottweilers, Boxers, Doberman Pinschers, Giant Schnauzers, American Pit Bull Terriers, and American Staffordshire Terriers. Search and rescue dog (SAR) - This dog is used to locate suspects or find missing people or objects. Bloodhounds are often used for this task. Arson dog - Some dogs are trained to pick-up on traces of accelerants at sites of suspected arson. 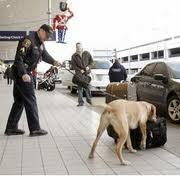 Cadaver dogs - Some dogs are trained in detecting the odor of decomposing bodies. Dogs' noses are so sensitive that they are even capable of detecting bodies that are under running water Pioneering work was done by Dr. Debra Komar (University of Alberta) in Association with the RCMP Civilian Search Dog Association in this area. The result was the development of training techniques that resulted in near 100% accuracy rates. Her research has been published in the Journal of Forensic Anthropology. Detection dog - or sniffer dog is a dog that is trained to and works at using its senses (almost always the sense of smell) to detect substances such as explosives, illegal drugs, or blood. Hunting dogs that search for game and search dogs that search for missing humans are generally not considered detection dogs. There is some overlap, as in the case of human remains detection dogs (sometimes called cadaver dogs), trained to detect human remains. They are also used for drug raids to find where the drugs are. In the state of California, dogs are trained to detect the Quagga Mussel on boats at public boat ramps, as it is a invasive species. Sniffer dogs have also been enlisted to find bumblebee nests. The Bumblebee Conservation Trust has trained a springer spaniel to detect the colonies, assisting them with the conservation of threatened species. Some prisons have dogs trained to detect illicit cell phones in prison cells. Guide dog - (also called seeing-eye dog) are assistance dogs trained to lead blind and visually impaired people around obstacles. Although the dogs can be trained to navigate various obstacles, they are partially (red-green) color blind and are not capable of interpreting street signs. The human half of the guide dog team does the directing, based upon skills acquired through previous mobility training. The handler might be likened to an aircraft's navigator, who must know how to get from one place to another, and the dog is the pilot, who gets them there safely. Service dog - is a type of assistance dog specifically trained to help people who have disabilities including visual or hearing impairment, and also to help people with mental disabilities including Post Traumatic Stress Disorder (PTSD) and severe depression. Desirable character traits include good temperament or psychological make-up, good health including physical structure, biddability and trainability. Service dogs are sometimes trained and bred by service dog organizations. Some dogs are donated by private breeders, and some are selected from shelters. Any breed or mixture of breeds of dog might produce a representative capable of service work, though few dogs have all of the qualities in health, temperament, biddability, trainability and physical ability needed. Such a dog may be called a "service dog" or an "assistance dog," depending largely on country. Other common names include "helper dog," "aide dog," and "support dog." A therapy cat is a cat trained to help ailing humans in a medically beneficial way to take advantage of the human-animal interaction for purposes of relaxation and healing. Therapy cats have been used as companions to help the recovery and well-being of stroke victims, lower blood pressure, decrease patient anxiety, increase sensory stimulation, ward off depression, inspire a "sense of purpose", and assist teens at juvenile detention centers and children with developmental disabilities and to help children with language, speech and hearing problems. Some nursing homes have therapy cats that are used to be companions to their elderly residents. Therapy cats are also sometimes used in hospitals to relax children who are staying there. There have been arguments made that therapy animals can work as well as or better than conventional pharmaceutical medicine for helping people relax, lowering stress levels and blood pressure decreases, causing the heart rate to slow down. According to one report, the cats can help children and teens with special needs to "feel relaxed", and that the human-cat communication is beneficial. One researcher reviewing 25 studies found positive effects of pets on patients in nursing homes, and found evidence that the animals helped patients be more alert, smile more often, and that the presence of the pets helped physically aggressive patients to calm down and allow other humans to be near them. Some have begun to use cats as "service" cats, for example, children with Asperger's or autism.